I’ve lived in the same city for nearly twenty years now, and there’s a tradition here every Christmas season. The city allows religious expression at a street intersection in our town. It’s become a distinctly festive portion of the city during the weeks leading up to Christmas; it’s heavily decorated with lights and garland. There’s even a large pine tree on one of the four corners decorated with ornaments and Christmas packages. 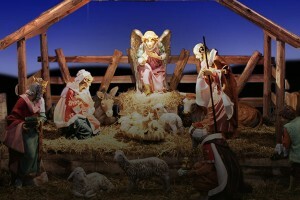 Years ago, a local church added to the effort by providing an elaborate, life-sized Christian Crèche. The Nativity display was constructed on the public grassy area on the corner opposite the Christmas tree, and for many years, this intersection in our town looked much like other public Christian Christmas displays seen across the country. Of course, that’s all changed now. Over the years, other religious groups decided it was unfair Christians should have this opportunity to express themselves publicly on city owned property. At first it was simple enough. The local Jewish community wanted a large menorah to be placed on one of the four corners. This seemed completely appropriate, given the fact Christmas season occurs at the same time as Hanukkah. But it didn’t stop there. Once other religious groups saw the attention this intersection got during the Christmas season, they began to complain that the city was unfairly favoring the Judeo-Christian traditions. The city had to make a decision. I actually think this would have been a very easy decision to make, but the city council faltered. They allowed every other religious (and non-religious) group who wanted to construct a display to add to the Christmas intersection. The corners are now crowded with displays from Islamic groups, Bahai groups, New Age groups, Buddhist and Hindu groups and, starting this year, a pagan group as well. Here’s where I think the city council missed it’s opportunity to do the right thing. I do think its fine if religious groups want to express themselves and celebrate their religious traditions; the freedom of expression is vital if we want to live in the America our forefathers envisioned. But each of these groups has their own religious season. The Christmas season is about still about Christ, isn’t it? There is something distinctly Christian about Christmas, after all. I would never support Christians who insisted upon displaying Nativity scenes during Muslim celebrations of Ramadan, during Bahai celebrations of Ayyam-i-ha, during Buddhist celebrations of Visakah Puja, during Hindu celebrations of Mahashivaratri, or during pagan celebrations of Samhain. Our city could (and should) have offered these groups the opportunity to express themselves appropriately during their own seasons. Instead they allowed these groups to hijack the Christian celebration of the Christmas season. Truth be told, I bet that most of these groups have never even asked our city for the opportunity to express themselves during their own respective religious seasons. My fear here is the effort to secure equal representation during the Christmas season is really part of the continuing effort to erase the influence of the Judeo-Christian worldview from our culture altogether, especially now as I see the entrance of atheist pagan groups into the foray. I can’t help but wonder where all of this is headed. If we want to live in a world where diversity is respected, we had better be careful to respect each other’s cultural and religious traditions. We can begin by respecting our distinct religious seasons. We can express our diverse religious beliefs, but these expressions ought to be timely.